This Wholesale Sign Supply Company Sells Direct! This Sign Making Equipment is In Stock Now! Cherry wood finish complements almost any indoor environment. 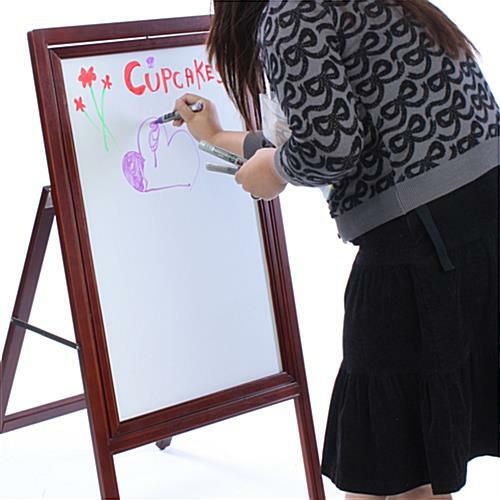 Includes two different write-on surfaces: wet-erase and dry-erase sides. 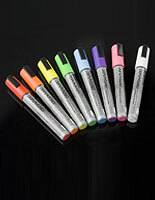 Use with dry-erase, wet-erase and liquid chalk markers - not meant for traditional chalks. Reversible 18"w x 27-3/4" black/white board flips easily on a vertical axis. 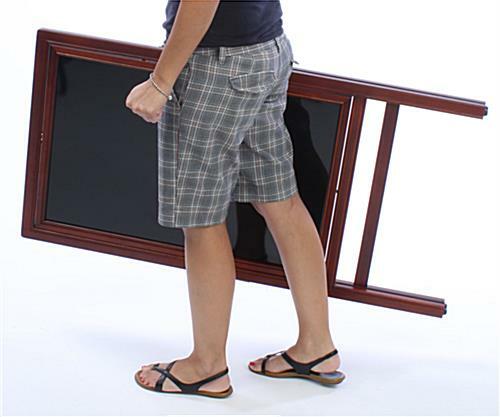 Unit folds up for easy storage and portability. 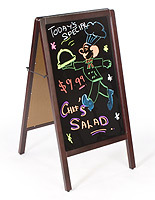 This write-on sign supply is a great choice for restaurants. 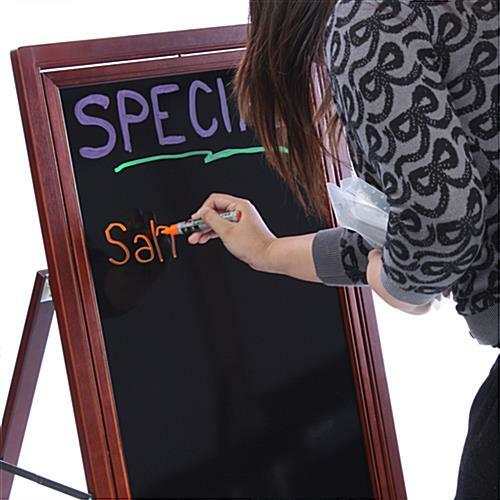 The more casual look of the white board surface is perfect for displaying lunch specials. 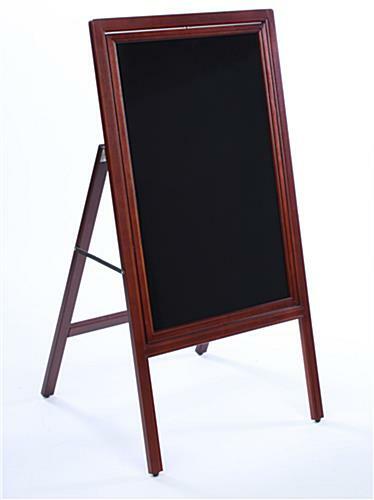 The more sophisticated look of the black surface is ideal for displaying dinner specials. In just seconds, your lunch display can be turned to display your dinner menu. These reversible sign supplies with both black and white board are excellent choices for retail settings as well. The dual surfaces allow one sign to create a variety of effects. 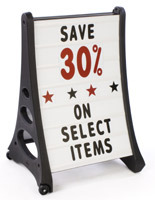 Entice shoppers to enter your store with these distinctive sign supplies presenting such message as Clearance", "Sale Event" or "New Arrivals"! These sign supplies are also great teaching aids and are perfect for schools and daycare centers. These double-sided sign supplies are easy to clean, too! The white dry-erase surface wipes easily with a dry-erase eraser or cloth. The black wet-erase surface requires a damp cloth for message removal. Messages on the white board must be prepared using dry erase markers. Messages on the black board must be prepared using wet-erase markers or liquid chalk. The writing area on these sign supplies is a large 18" x 27-3/4". With this great sign supply, you get two displays for the price of one! Buy these write-on sign making tools today! These sign supplies offer two writing surfaces. 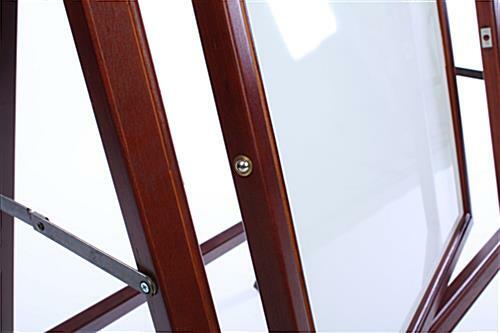 Each is crafted of wood with a beautiful cherry finish on the frame. These elegant sign supplies are designed to easily match every indoor décor. These sidewalk signs, sign supplies with two surfaces, are easy to use. Just turn the board to change display surfaces. 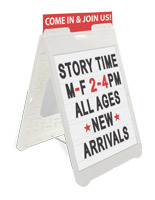 These sign supplies, also called sandwich boards, are excellent promotional tools to highlight special events, sales, new arrivals, daily specials, and other important announcements. If your business frequently changes messages, this double-sided sign supply is right for you! 23.0" x 42.0" x 20.5"
23.0" x 44.0" x 1.8"